Did you know you can create PayPal Payment Form with a FREE JotForm account? Creating PayPal Forms with JotForm is quick and easy. Just follow the process below and you'll be integrated with PayPal in no time. 1. PayPal Account: Enter your PayPal account email address. If you're using PayPal Pro or Express, you need to enter your PayPal API Credentials. 2. Currency: Select the currency. 2. Sell Subscriptions: This option is for recurring payments. Once a user is signed up, their PayPal account will send you payments periodically. You can get these payments weekly, monthly, or yearly. 3. User Defined Amount: This option allows users to input a custom amount as a regular payment. 4. Collect Donations: This option allows users to input an amount as a donation. 1. Users Can Select Multiple Products: Select yes if you want users to be able to select multiple products. 2. Show Total Price on the Form: Select yes if you want to show the total amount on the form. 3. Sandbox Mode: The PayPal Sandbox is a self-contained, virtual testing environment that mimics the live PayPal production environment. It provides a shielded space where you can initiate and watch your application process the requests you make to the PayPal APIs without touching any live PayPal accounts. 4. Authorization Only: Enable this option if you want to collect orders and charge customers at a later date. To learn more about this feature, check this guide: How to Enable Payment Authorization. 5. Require Shipment Address: If you'll be shipping a product to the user or need an address for some other purpose, select Yes. 6. Checkout Language: Select the language to be used on your checkout page. 7. IPN Relay URL: If you are using PayPal with another provider that needs to get IPN messages, you can enter the provided URL in the box. 8. Pending Payment Email: This option allows you to send an email to customers who fail to submit their payment on time. See this guide for more details: How to Set up Incomplete Payment Notification Email. 9. Clickable Image Preview: Enable this option to open product images in a lightbox window. 10. Use Decimals: This is enabled by default. Select No if you don’t want to use decimals. 11. Decimal Separator: You can choose to use decimal points or commas. 12. Redirected PayPal Page Style: To learn more about this, see this page from PayPal: https://www.paypal.com/customize. 13. Checkout Logo: You can elect to display your custom logo on the checkout page. The image you upload will replace your email address and/or merchant ID. 14. Checkout Cart Color: You can designate a border color to appear around the selected product items on the checkout page. Here's an example of the checkout logo and color. Enter your product, prices, and options here. Each product must have a name and price. You can also include an image for your product, set it as a required field, or make it selected by default. To sett up the quantity and additional options, see this guide: How to Add Options to Payment Forms. After adding your product or subscription items, simply click the SAVE or CONTINUE button to save your changes. You can edit the label of your question by clicking on "My Products." You can also click the wand icon to relaunch the payment wizard and update your product details. Extra: Curious about the difference between PayPal and PayPal Pro? What does it mean when a payment says "client authentication failed?" User defined amount shows the word “free” if I don’t input a value. This is annoying as I don’t want it to show up because there are different values for different quantities. How to remove this? I have a payment submission. How do I collect? will a paypal button appear on form while in edit mode or after publishing ? I am facing some errors there. how can we separate the products on different pages? I am trying to set up a paypal form but am getting an error. It says this intergration has not yet been configured. Please run the wizard for configurations. what can I do to get this working. I am creating a membership application form and testing in Sandbox mode using my own info. Using PayPal. When I hit SUBMIT it takes me to "Log in to your PayPal account" but has no option for them to just use their credit card thru PayPal with NO account. Your tutorial shows that there should be 2 options after submit - use their existing account or a one time use with credit card. Am I doing something wrong? It never redirects, submits, or anything. I would like to add a paypal credit button to the checkout. Is that possible through here? how do I update my form, when I want to use another business Paypal account on my form for payment? I've read this about 12 times. I'm still not getting an absolute answer on whether jot forms can do installment payments - which is different than subscriptions. i have set up my form with a PayPal account with the regular PayPal method and i would like to change it to the PayPal Pro method. How do i change that? I put the API of my Pay Pal count, choose the image..... but after when I prove and when clic in the image, dont do anything. What I did bad? Hi I have participants that are trying to send a form to me to register for events I have, and it says it wont let them submit form as my paypal isnt set up. I dont want to accept paypal; they are just registering, can you advise? I'm trying to set up a fundraiser contest, but there aren't any products. Basically, users submit photos for the contest, but they pay $5 per photo upload. I can't seem to figure out how to make this work, could you assist me? 1. I'm wondering how do I setup Paypal to ONLY redirect the people who want to use Paypal/to pay? Essentially, I only want the people who are opting to pay via Paypal to be redirected to the Paypal page or alternatively with the Paypal Pro is there an option to enter the CC details on my form and make it a non-mandatory/required field? 2. 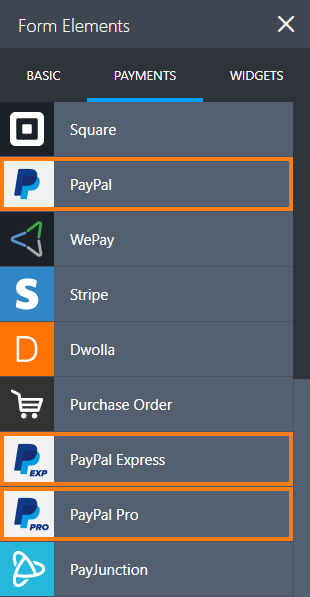 I have been working on my partners jotform to create the Paypal options and when testing the Paypal option, we've found that if we get redirected to the Paypal payments page, that we loose all of our Jotform pre-entered data if we don't complete the Paypal transaction (when returning back to the original page). Is there a way to avoid the loss of pre-entered data after not completing a Paypal payment (ie. returning back to the seller's page). ? Will I be charged a fee from paypal for using this service if I have just have a personal paypal account? estoy teniendo problemas con la integración de paypal en mi formulario, llevo varios dias sin respuesta. In the PayPal integration, there is an option "Use PayPal Checkout Buttons". I've chosen "Yes" but the form still shows the previous submit button I'd set up, and not the PayPal button. Why is this? I've tried to delete the submit button, hoping a PayPal button might replace it, but no luck. If I download a PayPal button and upload a button image to replace my Jotform button, crazy things happen to the sizing: the image expands beyond the form and pixellates because it's stretched. Why doesn't "Use PayPal Checkout Buttons" simply make the PayPal button appear automatically? Is there a bug or am I doing something wrong? I have created a form for donations for my church app. I have used the Jot plugin and inserted the publish link. However, when testing i enter an amount and my info. But when I click the "go to payment page" it says please wait. After 10 minutes of waiting it still does nothing. Any ideas? I'm trying to use paypal to gather money for a common payment towards a downpayment/registration for a class reunion retreat. No goods or services are being sold. Is there any way to get around the high fees being charged? Are there any issues adding a form+PayPal to a Wix site? How to collect payment 30% only from total of multiple products(items) staight without to put any coupon codes? What about a pick up & delivery service? I need to be able to authorize payment and then send a bill with the correct amount after the item is picked up and weighed. Do you have to create a paypal account if you are intending to only make a one time purchase. We have clients looking to just enter in their payment details and move on without creating an account. Any help would be great, thank you. I have completed this three times. Having all kinds of problems and can't seem to get anyone to answer me on here. Is there a phone number to actually call a tech? I just pressed Submit, paid in paypal (the seller got the money), and the submission is still showing as pending. What gives??? The PayPal widget wizard wants a fixed price. There's not such thing in cleaning apartments. The form I intended to use on my site is supposed to gather info to set a price that cannot be known ahead of time. Is there a way to process the submission (ie. send emails, add to Submissions page) IMMEDIATELY and NOT wait until Jotform receives a notification from the payment gateway? PayPal is taking a while for it to process, and I'd like to know when someone submits the form immediately. I do appreciate the "Pending Payments" feature, but it would be great to know immediately when someone completes the form. I can follow up on the payment later. I have tickets priced at $125 each and a table of 9 priced at $1,125. The $125 price goes in fine, but the $1,125 price doesn't show up at $USD. It's just the number 1125. I experimented and found that any price above $999 shows up that way. anything $999 and below shows as a price. Is that a bug? I have a Standard PayPal account, not Pro, but I don't think I need Pro just to take a payment of more than $999. I followed these instructions but when I click submit, it only thanks me for submitting. It doesn't take me to Paypal, so I can't collect the money. 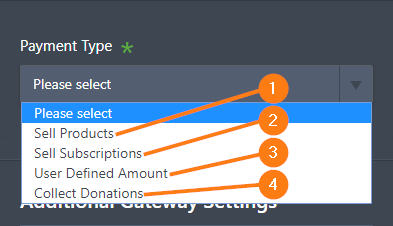 Any workaround to add products and a donation option? My form is for animal shelter and we have our "products" as the standard adoption fees. I'd also like to add the ability to include an additional donation amount. Hi, I am testing integration of Paypal on the form. I have $5 and $7 menu. If I check $5 and decide to uncheck it, it won't let me do it. Can you please advise as to how I can fix this issue? Thanks. I've created my form and i'm directed to Paypal just fine but it seems like you either have to have an existing Paypal account or register with Paypal to complete the transaction. However, I've noticed that on a mobile device (via my phone and ipod for example), I have the option of just completing the Payment using a credit/debit card without having to register with Paypal. Any ideas how I can get that option for desktop too? is there a maximum amount of orders that can be made using paypal and a free account? 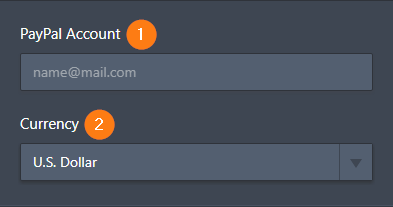 Is there a way to automatically send the user an email if they submit the form but their Paypal payment does not go through (either not completed or payment problem)? Or conversely, can it send them an email only if their Paypal payment DOES go through. Right now, I have to monitor the Pending submissions and email them if their payment does not go through.